Regardless of how popular a game is, it still has its own dedicated playerbase, some of which, unfortunatelly might get banned in that particular game for various reasons. That being said, a lot of the not-so-mainstream games out there either don’t have a dedicated support center for ban appeals, or if they do, it can take a bit to find it, and in the unfortunate event of finding your account banned, finding the proper contact channel can be quite a hassle. 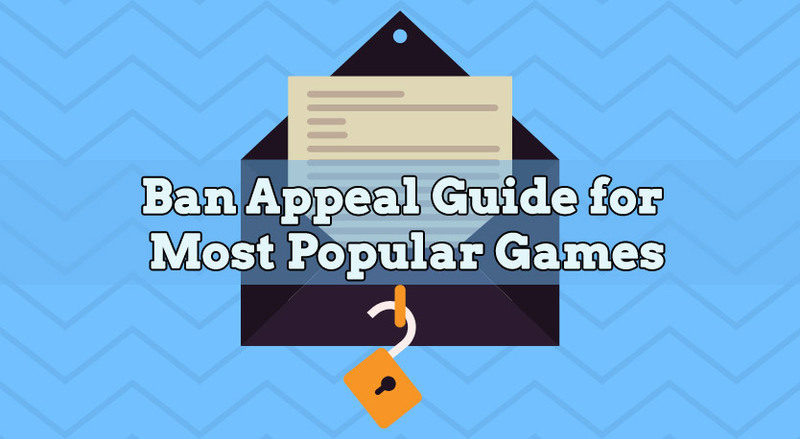 With that in mind, we decided to cover a ban appeal guide for some of the most popular games, updated for 2019, in the event where you want to get in touch with a game’s support, but can’t find how to do so. So, in somewhat of an alphabetical order, let’s go over the ban appeal guide for some of the most played games! As confirmed on their official FAQ, in order to get unbanned from Albion Online, the only way of appealing it or otherwise contact Albion support is by sending an e-mail to [email protected]. When sending the Albion Online ban appeal, make sure to include as much information in regards to your ban, as well as to your account, so they can verify your ownership and identity as the account owner. Once the Albion Online ban appeal is sent, make sure to also keep an eye on your mail’s Spam folder, as sometimes, based on your mail provider, their reply can end up in there! Note: this is the same form and website for appealing an Anarcy Online ban! Although Age of Conan has an actual online form, it is essentially, still an e-mail based ban appeal. write your actual Age of Conan unban appeal and then press Submit. [email protected] from your account’s registered mail address, as confirmed by their support page. When sending the mail, make sure to provide as much accurate information as possible in regards to your Age of Wushu ban as well as to your ownership of the account, to further minimize the back and forth mails with verification questions. If you like forms, then you’re in luck. Well, not in that much luck, since if you’re here, you most likely got banned from DayZ, but hey, at least you can complete this DayZ unban form in order to appeal your ban. So, what that means is that you can go on their support page right here, then based on your issue, choose between “My character was randomly wiped” and “BattlEye global ban”. write your detailed DayZ unban appeal under the “Message” field, with as many details as you can, then complete the Captcha test and press Send. You’ll be contacted back via e-mail, so make sure to keep an eye on it whenever DayZ support gets back to you! Pretty straight forward ban appeal form for Dota 2 as well, for which all you need to do is go on their contact form here and complete the fields accordingly. Make sure to input your correct e-mail address, namely the one behind your Dota 2 account, so they can locate the account, since that’s the only way of identifying the account in question. Enter a relevant subject, such as “Ban appeal”, then proceed to writing your Dota 2 unban appeal under the message field, and provide as much information about it as you can, complete the Captcha test then click on “Send your message”. You’ll receive the answer via mail, so keep an eye on it, as well as on that Spam folder! Bans for both Dying Light along with Dying Light: Bad Blood can be appealed through the same support form, which you can find right here. Once you get on the above mentioned unban appeal form for Dying Light, choose the game you want to get unbanned from under “Product Name”, then proceed to entering your account’s mail address. Complete the subject behind your request, such as “Appealing a ban”, then fill in the description with the information as to why you believe you got banned from Dying Light, as well as what happened that got you banned. Attach any relevant files, if any, give your consent for processing your personal data, complete the Captcha code then submit your Dying Light unban appeal and wait until you hear back from them via mail. Friday the 13th: the Game is very well known for its ban waves, as well as for its unban wave, thus giving certain players accused of cheating a second chance. As for the unban appeal, Friday the 13th: the Game has a pretty straight forward process, which requires you to submit a mail to [email protected]. That’s all, although do make sure to input as much information in regards to your ownership and your ban to reduce the time required for your case to reviewed, as they get up to 300 mails a day. That also means that it can take a bit before they get back to you on the ban appeal, so make sure not to send any additional mails in the meantime. If you got banned from Insurgency, then at least you’re in luck in regards to their Support and how to appeal an Insurgency ban. All you need to do is to go on the Focus Home support page, and fill in the “Can’t find a solution?” form on the left side of the screen. Input your e-mail address behind your account and choose Insurgency from the drop-down list of “Looking for help with”. Choose your operating system then start writing your Insurgency unban appeal under “Describe your problem”. Provide as much information as you can in regards to your situation and as to what do you think happened that got you banned from Insurgency, then complete the Captcha field and press submit. Note: This applies for Star Trek Online ban appeals as well! 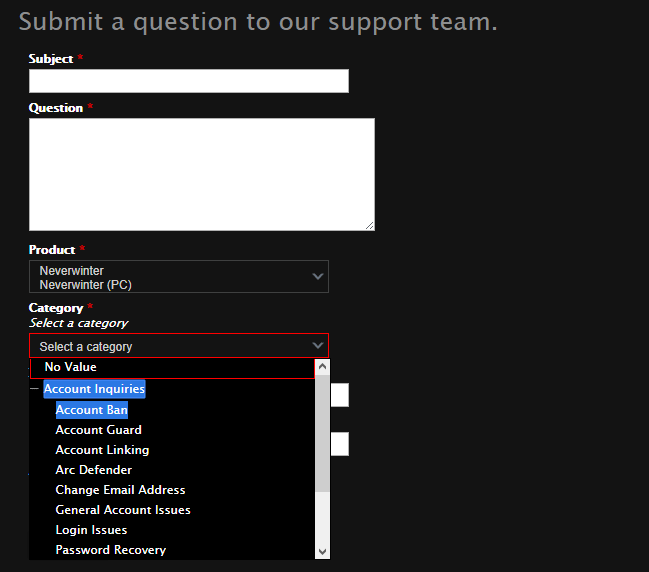 In order to get unbanned from Neverwinter, you need to submit a ban appeal on their Customer Support form right here. You’re required to be logged into the account in order to appeal the Neverwinter ban, so once you log in, you’ll be presented with the actual form. In it, you’ll start by writing the subject of the request, which would be “Appealing my Neverwinter account ban” for example. Afterwards, write your ban appeal under the “Question” field. Yup, it says question, but it’s more of a description kind of field. Don’t be discouraged by the size of the field, as despite its size, it will be able to house your entire appeal. As for the product in question, that’s where you need to select Neverwinter, and immediately underneath it, the platform, which in our case would be Neverwinter -> Neverwinter (PC). And, for the last mandatory field, namely “Category“, select Account Inquiries, followed by Account Ban as its subcategory. Attach any relevant documents, if any and if relevant, then just press Continue, and your Neverwinter ban appeal will be sent! Unlike the PUBG unban appeal, the PUBG Mobile one is much more straightforward, as it only requires you to send an e-mail to [email protected], mail which is essentially the actual PUBG Mobile ban appeal. It’s vital that you send this PUBG Mobile ban appeal from your account’s registered mail address, as in, the same mail you have used to create a PUBG Mobile account. Since PUBG Mobile is, well, a mobile game, make sure to include as much information in regards to your device, as well as what you believe the culprit could have been in regards to why you got banned from PUBG Mobile. Note: This guide applies for Skyforge ban appeals as well! In order to appeal to get unbanned from Revelation Online, you first need to log into your My.com account. Once that’s done, proceed to the Revelation Online knowledge center, then click on “My account has been Muted/Frozen/Banned“. Scroll down to the bottom of this page, then click on the “submit a ticket“, which will take you on the Revelation Online ban appeal form, specifically, this one. write the detailed and thorough RO ban appeal under “Details“. 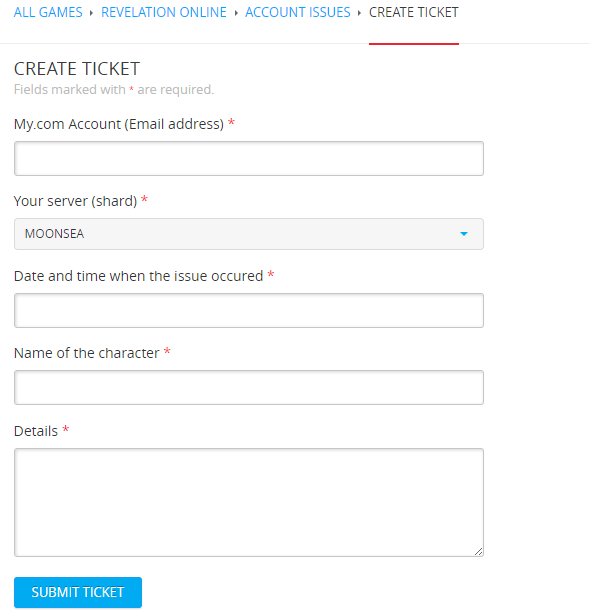 After you complete the form, simply press the blue “Submit ticket” button underneath, and that’s it! Your Revelation Online ban appeal will be sent off to Customer Support, and they’ll get back to you once they review it. Roblox has a pretty straight forward unban appeal form as well, without requiring you to log into the account or any other hassle. The support link where you can appeal to get unbanned from Roblox is right here, consisting of a form that you need to fill in. So, let’s get right to it! The first part of the form consists of you verifying your account ownership information, which can be done by writting your First Name, Mail and Username with which you play Roblox. 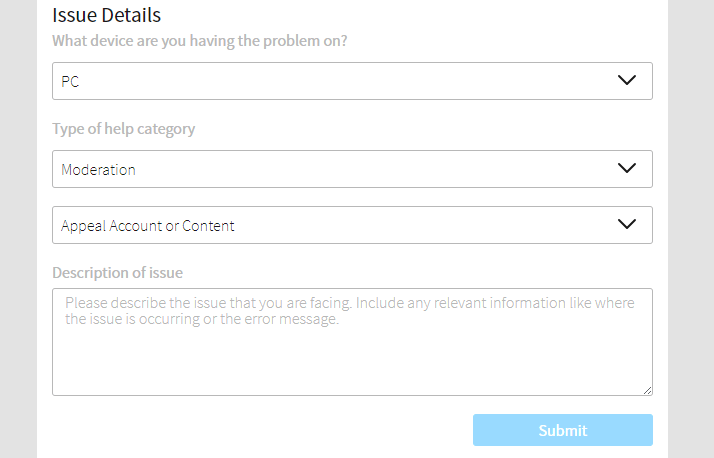 write the ban appeal under the “Description of issue” form, and make sure to include as much relevant and accurate information as possible in regards to your Roblox banned account. Once you’ve done all of the above, simply press the blue “Submit” button on the bottom right underneath the form, and that’s all. Wait until Roblox support gets back to you, via e-mail, so make sure you also check the Spam folder. SCUM’s ban appeal needs to be done through EAC (Easy Anti Cheat), just like in the case of Rust, for example. That means that you need to go on this EAC form right here, and start by authenticating your account with the help of signing in through Steam. Once that’s done, you can proceed to enter your information, of which the only mandatory fields are the First name and Email. Continue by choosing the reason for which you’re appealing to get unbanned from SCUM, by selecting the option that applies for your particular case, out of the 4, then start writing your SCUM ban appeal under the information field. Ensure you’re coming up with as much correct and relevant information as you can about your case, along with what you think could have happened, to be sure that EAC has all the details required to be able to review your SCUM unban appeal. Lastly, submit your appeal then wait until they get back to you! 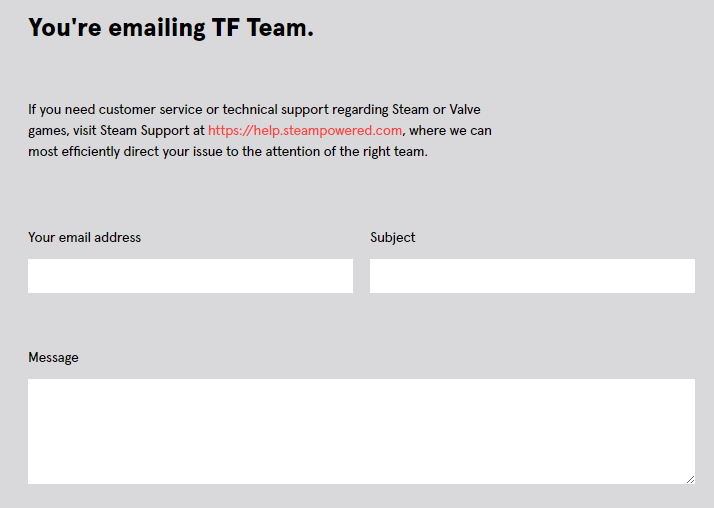 Just like with Dota 2, the way of appealing to get unbanned from Team Fortress 2 is by completing this form right here, which is the TF2 Team contact form. Since it’s quite a simple and straight forward form, make sure to double check that the mail address you’re writing is the one you’re also using for TF2, otherwise there will be no way for Support to get back to you or verify your identity in regards to the account ownership. As for the TF2 unban appeal, complete that in the “Message” field as thoroughly detailed as possible in regards to what you believe happened that got you banned from TF2, so the Support team has all the info when reviewing your appeal. attach any files or images if any (not mandatory). Press the green “Submit” button and then wait until War Rock support gets back to you! Mail based ban appeal for Warhammer as well, confirmed by their Support page here. for US – [email protected]. Make sure to send the mail from your Warhammer’s account mail as well, thus confirming your identity as the account owner, and add as many details to help the investigation and review as you can. This is it! We tried to include as many popular games as we could in here, although it goes without saying that we have most likely missed a few. We’ll constantly edit and update this post with changes to the ban appeal forms or by adding new games, so keep an eye on that if you’re interested in multiple games. Also, should you require help with a particular game that you don’t know how to submit a ban appeal for, please feel free to let us know either in the comments or in the contact form, and we’ll cover it and get back to you! Need help with a banned account?